Note: This post is nearly five years old, but it still demonstrates accurately how I look at paintings that really impress me. The links at the bottom of this site are where I find them. My favorite painting in the entire museum in Cody, Wyoming. 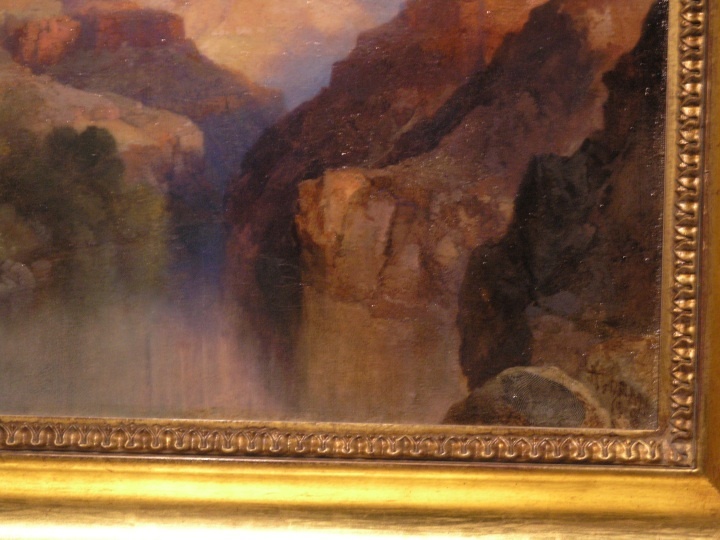 6 x 8″ landscape by Thomas Moran. Composition: everything is consciously off-center, whether by means of placement or lost edges or similar values. The forms are arranged in a zig-zag fashion, overlapping from foreground to background, gradually getting more blue and purple, and entering a higher value key. Proportion: the amount of canvas space the mountains take up gets smaller the further they recede into the horizon. Values & Edges: Darker to lighter from background to foreground. The lost edges at the bottom appear at first as mist, but upon closer inspection this is the reflection of the sky on a river. The suppression of hue, chroma and value in this reflected sky is notable for leaving the high values and blues to the sky portion. 3/4 low key, 1/4 high key, connected on the left half, separated on the right half. Repetition: the massive boulder taking up most of the right half is repeated behind and to the left of the red-white spire, cushioning this little red mountain and thereby framing it. The lone cloud is carefully positioned to balance the snow-capped mountains. The valley (negative space) created in the middle echoes the red mountain flipped over vertically. Colors: Extremely subtle variations. 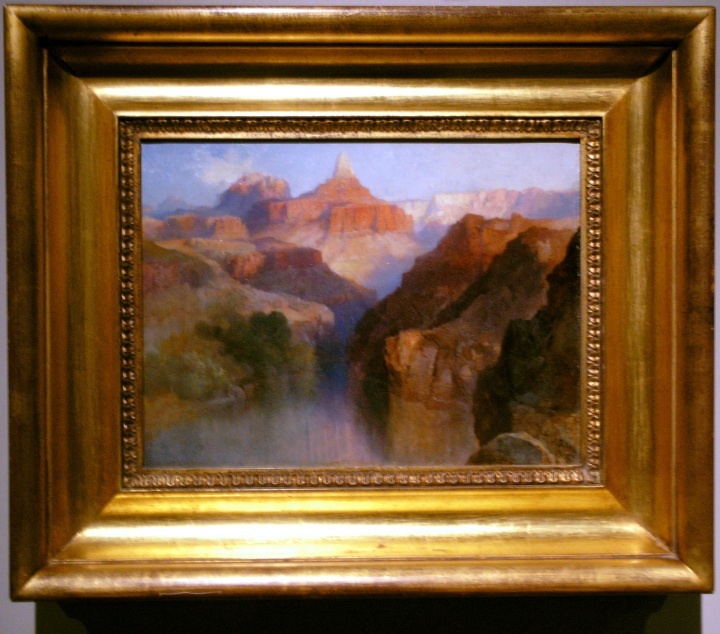 This is what distinguishes Moran’s landscapes from most plein air paintings. The white-purple band to the right of the red mountain has over 20 distinct colors arranged on a value gradation. Focal Point (above): The brightly lit gold outcrop to the right of the green trees is surrounded by filmy paint–very dark on the cast shadow side–which allows the form to jut out towards the viewer.